The Memphis Recording Service, Vol. 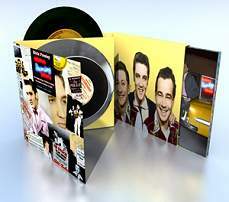 1 contains a book, a 5.1 DVD audio and a vinyl 45 single. There is a detailed book with new information, unseen documents and color photos covering the beginning of Elvis Presley's music career. The 5.1 DVD Audio disc contains 11 fully restored tracks from 1953-1954. All of them has been remastered using never before released original sources of masters, acetates and tapes to produce high quality sound never before heard. 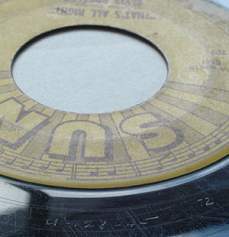 A selection of photographs is used to accompany each song. 'That's All Right' in its true Sun sound without the fake RCA echo. This track has now finally been re-mastered from the original Sun Mother master straight to 5.1 Audio/ Dolby Digital sound. This original version has never before been re-released on record, CD or any digital disc until now.